Somewhere, beyond the sea, a man and a woman got married with the blessing of a Big Daddy. Geek-themed weddings have forced attendees to cosplay as superheroes and gotten a little weird with a Katamari Damacy theme, but I think the most stylish I've seen yet is the BioShock-themed wedding of Anna and Jon. The Canadian couple tied the knot last year under the guard of a Big Daddy's giant drill. 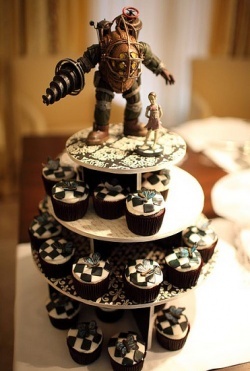 The wedding featured imagery from the game on its cupcakes, program, and even the groom's cufflinks. The cupcakes were decorated with the Blue Morpho butterfly from BioShock 2. On the top of the cupcakes' multi-tiered platform were detailed sculptures of a Big Daddy and Little Sister, who were even seen sneaking off into the woods. The wedding program shows a Big Daddy and Little Sister frolicking through Rapture, while it names the wedding a "Rapturous Affair." The definite coolest part of the theme were those cufflinks, which are made of a Big Daddy helmet and look custom made. While the event wasn't totally encompassed by BioShock, it was nice how the game's characters and themes ware snuck into various important areas. It would have been cooler if the bride and groom dressed up like a Big Daddy and Big Sister (a Little Sister would be too creepy) and were married by Andrew Ryan who then went on to (*SPOILER ALERT*) get bashed in the head with a golf club, but what Anna and Jon put together was pretty cool too.